***Please note: the photos show the raised areas of the goddess pendant, most notably the mouth and nose, as being particularly light in color. 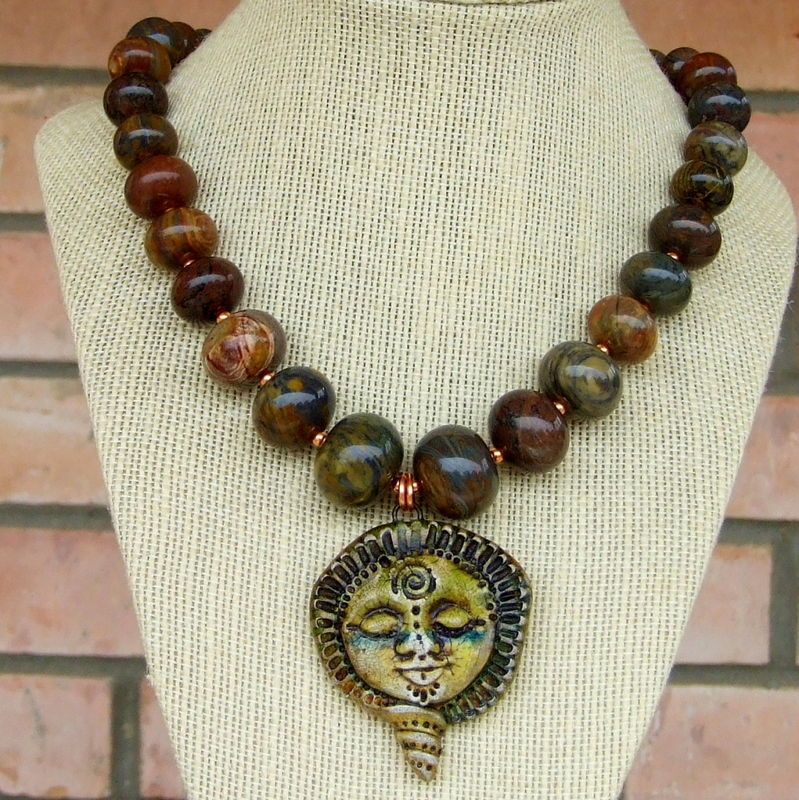 In real life, those areas blend much more evenly into the color scheme of the pendant. 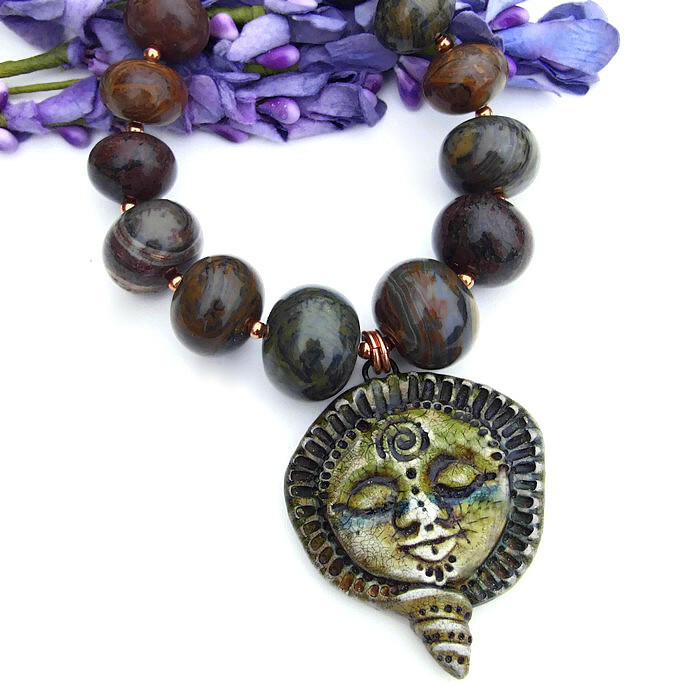 To perfectly complement the goddess face pendant, chunky jasper gemstone rondelles were used. 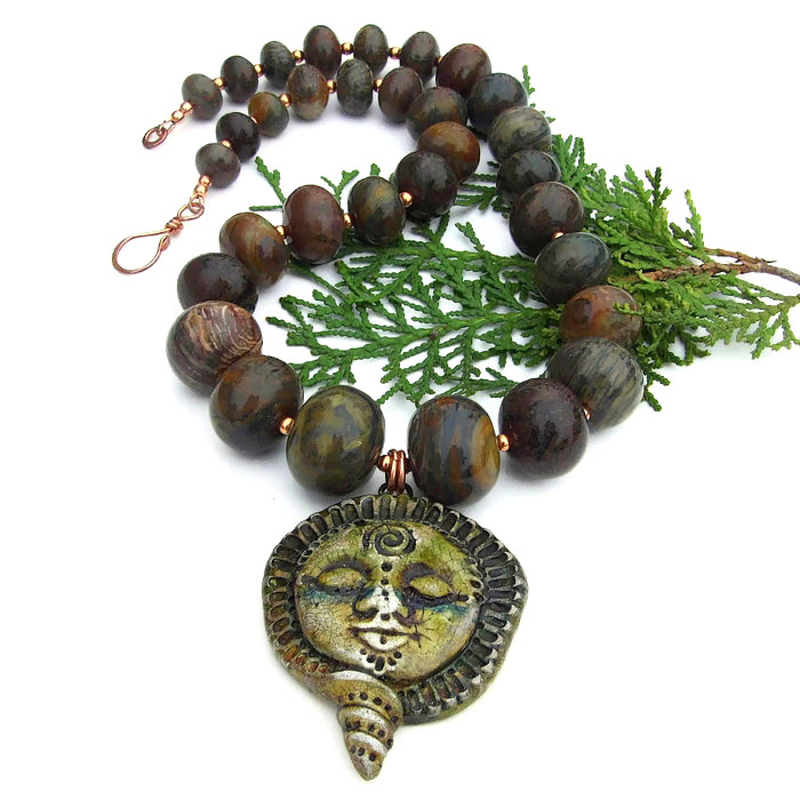 The natural earthy swirling colors of the jasper range from pale beige through mossy greens, brick red to black, many pieces containing several of the colors, each piece unique. The jasper i graduated in size, the larger gemstones in front and the smaller to the back. 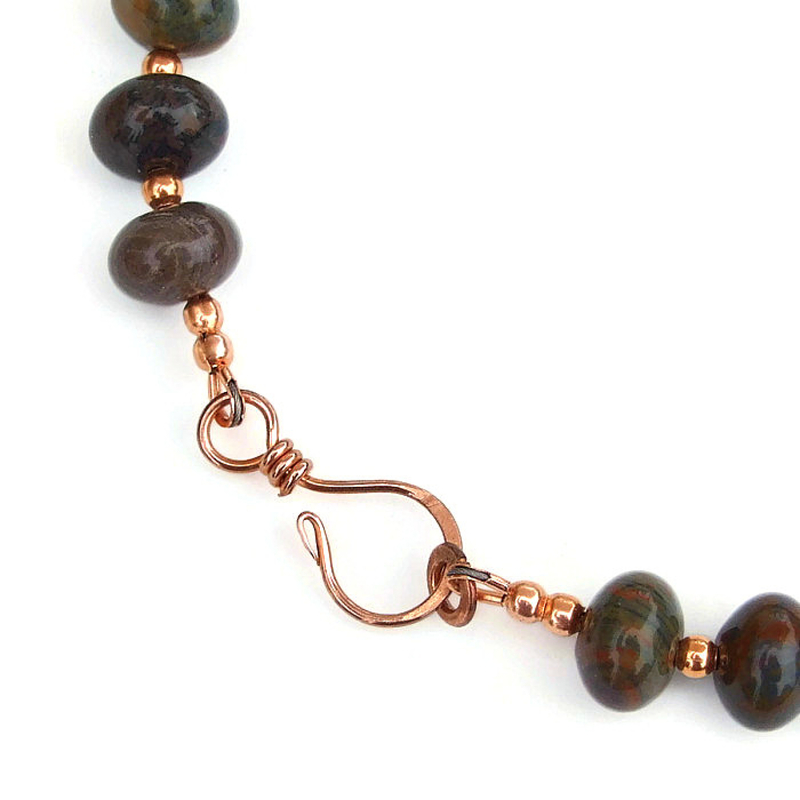 To add gorgeous glow and a sinuous drape to the overall design, 3 mm copper beads separate each jasper rondelle. 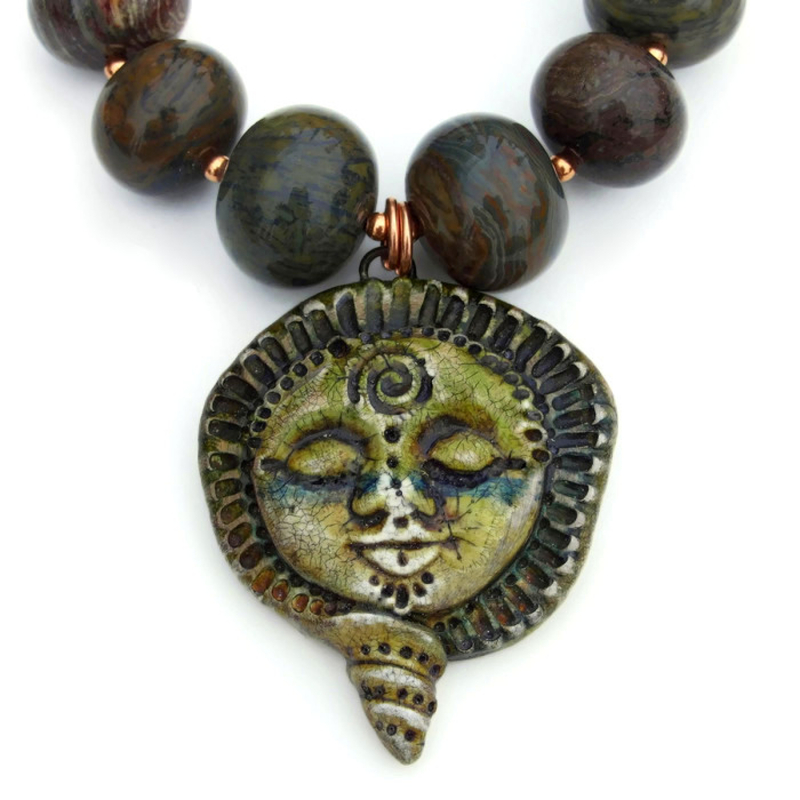 A handmade (by me) copper hook clasp and hammered closed ring finishes the necklace. 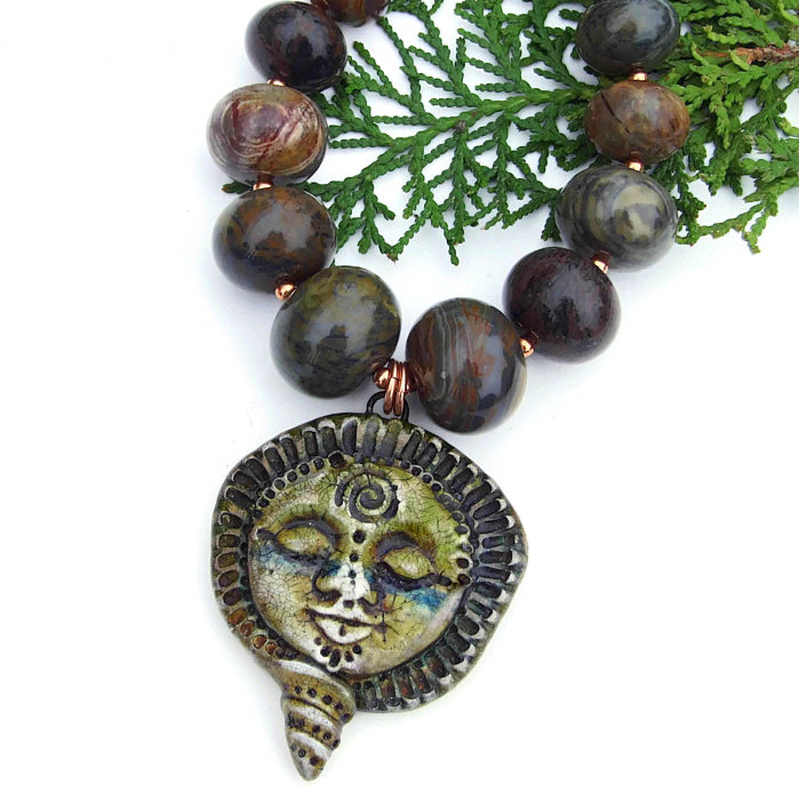 Carefully designed and handmade by Catherine of Shadow Dog Designs, the SÍOCHÁNTA pendant necklace was created for the woman who adores wearing handmade artisan jewelry . . . and who has more than a bit of goddess in herself! 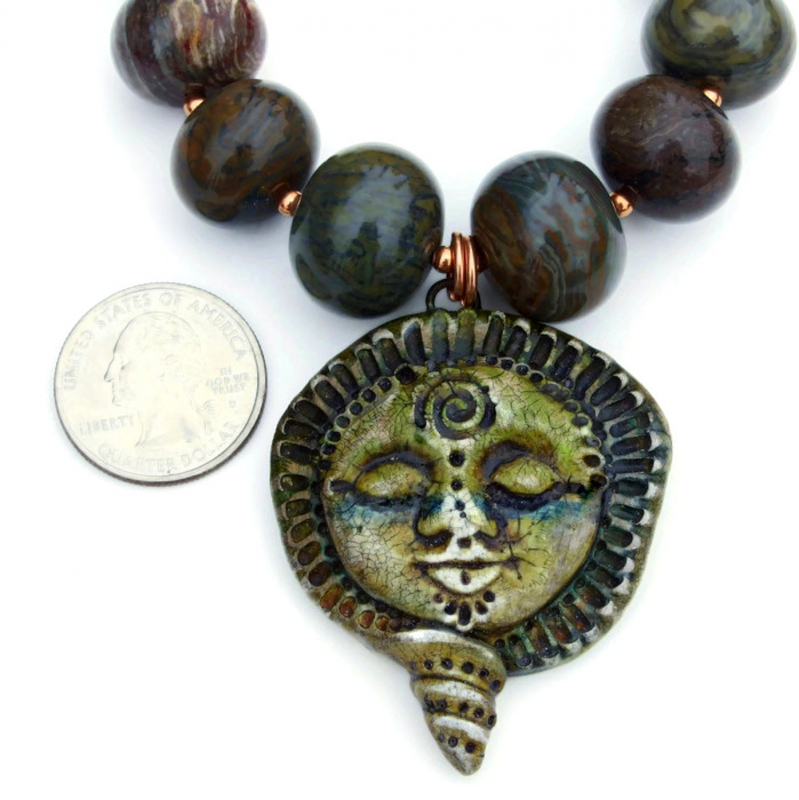 *** For a better understanding of the relative size of the goddess pendant and jasper rondelles used to create the SÍOCHÁNTA necklace, please be sure to check out photo # 6 for a size comparison with a quarter. 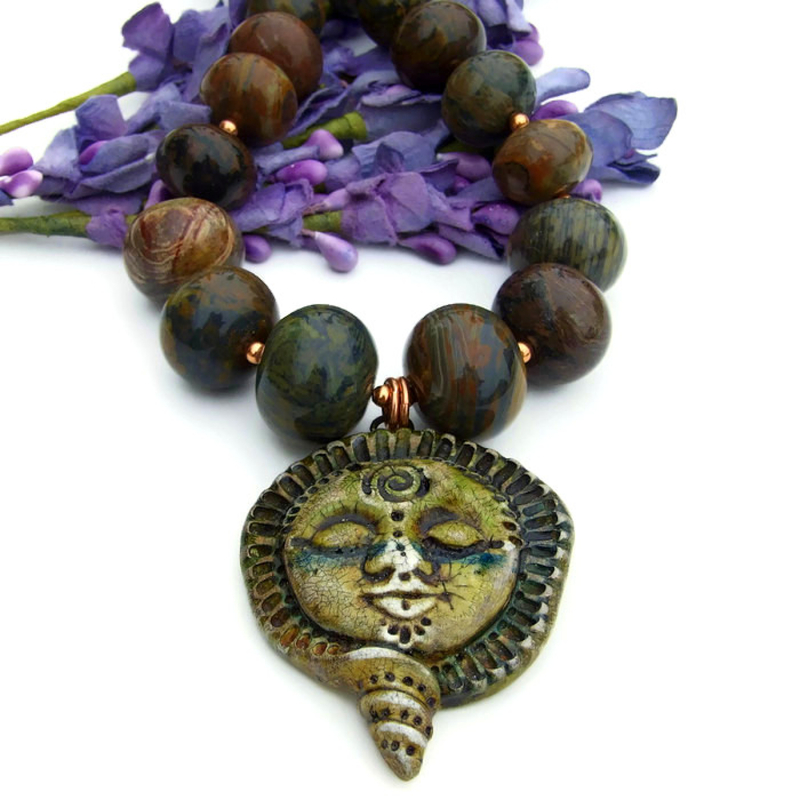 A peaceful goddess represents the feminine strengths of great caring and compassion, the acts of creation, and the source of sustenance and protection. 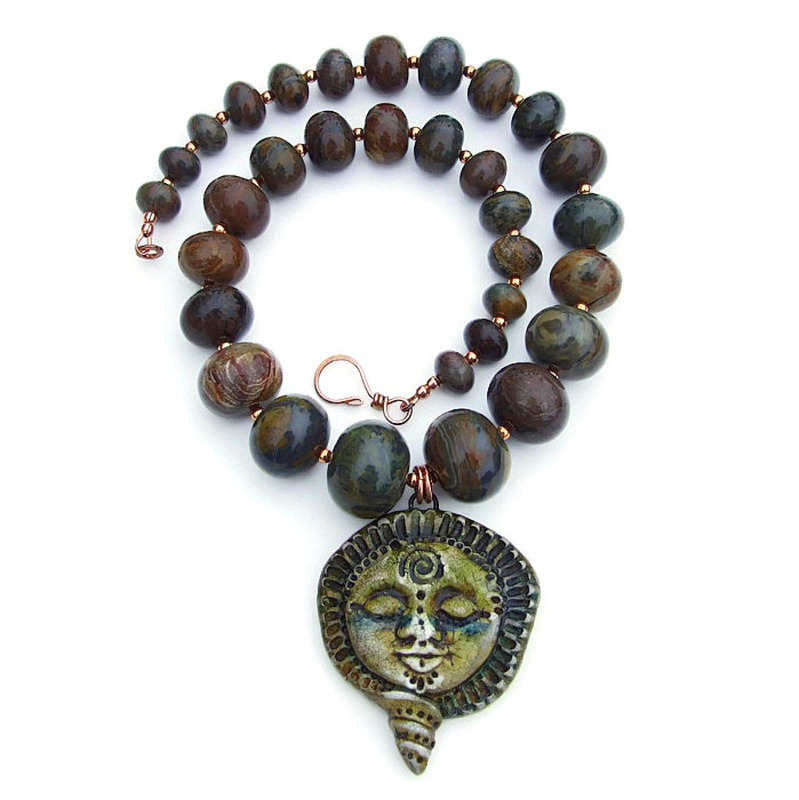 A spiral is one of the ancient goddess symbolism in use since at least the late Paleolithic era; it represents the unfolding changes during the journey of life. 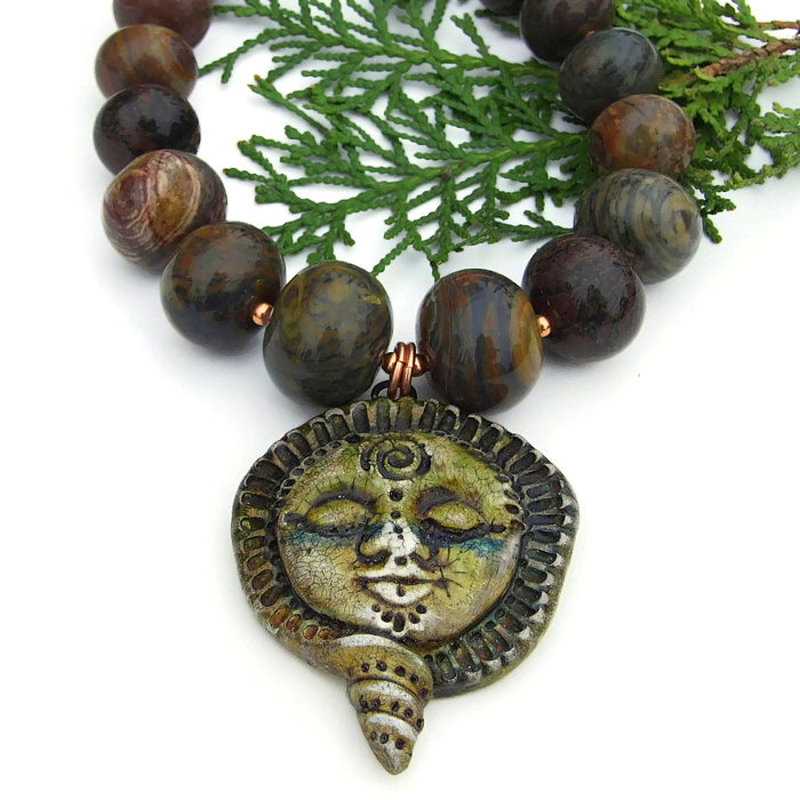 Jasper is said to give the wearer the courage to speak out for justice and the bravery to achieve personal independence. 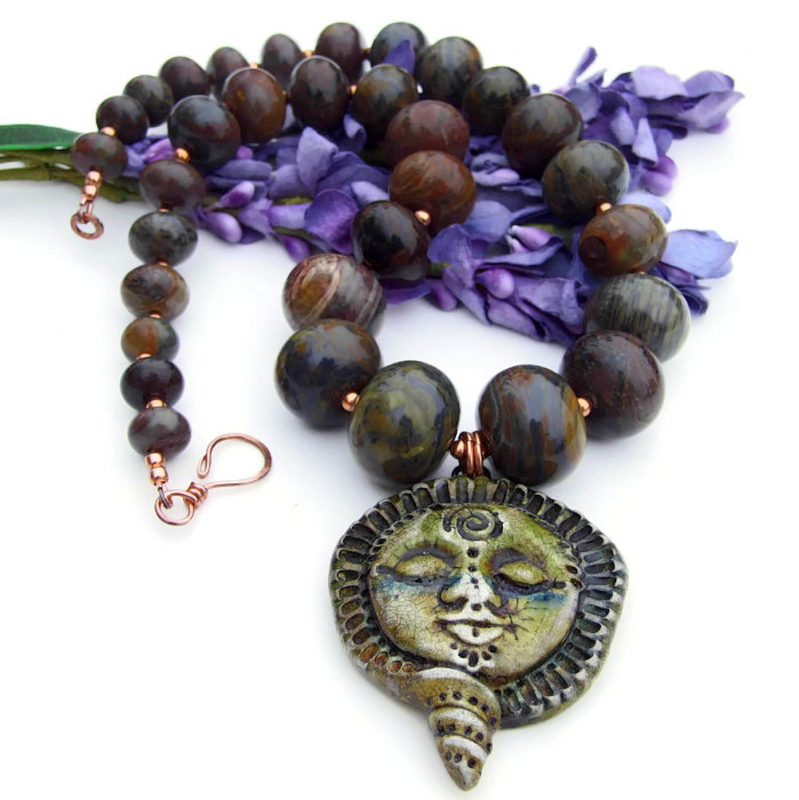 Copper is said to allow the wearer to recognize barriers in the path of personal development. The SÍOCHÁNTA artisan necklace was carefully designed and handmade in a dog friendly, smoke free studio. 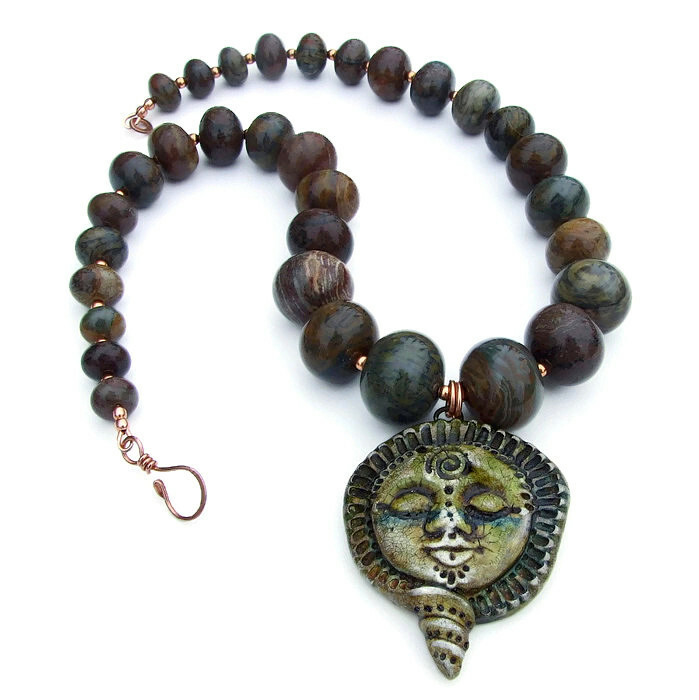 The necklace will come with two informational drop tags: one with the piece's name; the other lists the materials used in the necklace and the language of the stones and metals. It will be carefully packed in an organza jewelry bag, perfect for gift giving to a loved one . . . or to yourself! *** Photos of my jewelry are taken outside in natural light. The colors of the items used to create the jewelry are extremely close to the actual color on my own computer’s monitor. Please be aware that not all monitors show colors exactly the same. The colors may appear lighter or darker on your monitor.